would you be able to spot the symptoms of lyme disease? Even with diligent tick checks and prevention treatments, the risk that one of those bothersome bloodsuckers will stow away somewhere in your pet's fur is still pretty prevalent. For reason that exposure to Lyme disease is increasing, simply being a bit more alert and aware of your dog's behaviors could help you spot a symptom before it evolves into something more harmful. Fingers are always pointing at the deer tick when this endemic comes to light... but they're only blocking the view of the real villain! Much smaller than it's carrier, the true source of Lyme disease sits within a bacteria called Borrelia burgdorferi. Ticks become infected with these microorganisms while feeding on mice and other small animals, kick-starting the cycle of tick-borne illness. With a better understanding of the inner-workings of Lyme disease, you will find yourself at an advantage when trying to recognize and acknowledge it by knowing where to look! 1. Being the most distinguishable clue, feeling a small bump while petting your dog is a plausible sign of a tick bite; don't ignore it and examine your dog's fur to get a closer look! 2. If you see a tick inside of your home, chances are that you or your dog probably brought it in. Do your best to get the tick out of the house and give your dog a quick examination. 3. Since they like to hide in warm, damp places, it is common that a tick may find shelter in your dog's ear canal. If you notice a lot of head shaking, grab your flashlight and investigate the depths of your dogs ear for any burrowing ticks. 4. An anchored tick may cause your dog to lick or nip at the bite site, resulting in unexplained scabs. 5. In the unfortunate case of an actual tick bite, you will likely notice that your dog has a fever. Watch for signs of weakness, loss of appetite and unusual panting. By keeping a closer eye on your furry friend during these summer months, the opportunity to spot Lyme Disease early on could really save your pet's life. If the condition isn't treated in it's rudimentary stage it can cause your pet serious, long-term disabilities, contrary to the mild symptoms that occur when earlier attended to. History of Tick Exposure; if you remove a tick from your dog, it is important that you place it in a jar and mark the date of when it was removed; doing so will make pinpointing the source much easier and less stressful. 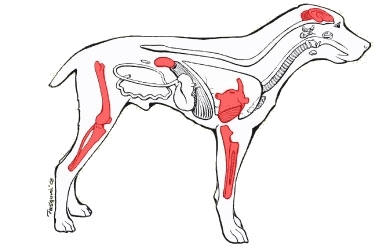 Typical Signs and Symptoms; let your vet know all of the symptoms you have noticed your dog display, even if you're unsure of whether or not it may relate specifically to Lyme disease. Blood Test; a simple test will detect any antibodies your dog has released in response to an infection and can easily be done right at the vet's office. Response to Antibiotics; most dogs have an incredibly rapid response to the antibiotic treatment; if symptoms don't improve within 48 hours, it's best to assume that your pet does not have Lyme disease and move forward to finding the real source of the problem. Maggie doesn't ask questions when there's peanut butter involved! After all of the stress and worry building up to the diagnosis, helping to heal your dog of Lyme disease proves to be the easy part; the antibiotic is given orally, so you can treat your pup to some peanut butter while treating their infection! Now that you're fully equipped with knowledge about how to detect and deal with Lyme disease, you must always remember that the best way to handle the problem is by preventing it before it starts! Tick control is the primary and most efficient way to keep your dog safe... and I'm sure they wouldn't mind the extra attention either! Alison has been with Dan's Dog Walking and Pet Sitting since 2014. She loves going on adventures with her dog Maggie in the woods and playing with her on the beach. Aly is a major advocate for the use of all natural pet products and specializes not only in giving animals the highest level of care, but creating educational material for our clients on how to best care for their pets with organic solutions. WANT TO LEARN MORE ABOUT DAN'S DOG WALKING AND PET SITTING?